On Friday, February 9, 2018, HousingWorks Austin hosted Housing + Economic Opportunity – Reimagining the American Dream. CLICK HERE TO VIEW VIDEOS FROM THE SUMMIT. This one-day summit at the AT&T Executive Education and Conference Center, Austin, TX, brought together experts and audiences interested in better understanding the challenges and opportunities around creating equitable economic opportunities for all. 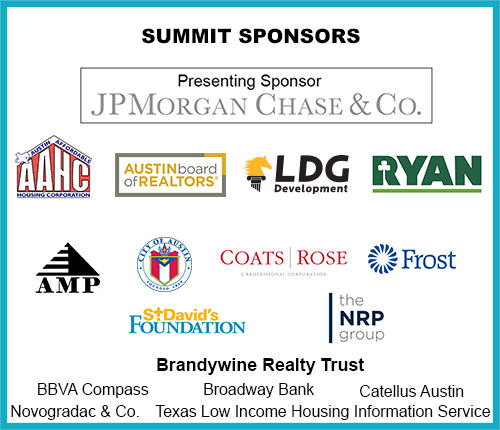 Interested parties attending the summit included members of the real estate and business industry, housing and community development practitioners, and financial institutions. Economic opportunity and mobility are at the core of America’s identity and values. These ideals are embodied in the American Dream, the unwavering belief that every American must have an equal opportunity to achieve success through hard work. Yet we know that the rates of intergenerational income mobility differ between cities and zip codes. How can we ensure that children from disadvantaged backgrounds have the same prospects for success as their affluent peers? How do we ensure that all children have equal access to economic opportunities regardless of the zip code they live in? What role can safe and affordable housing play in improving opportunities for all? The summit sought answers to these questions while focusing on Austin, Texas and the Central Texas region. Featured speakers included Rolf Pendall, Urban Institute – Metropolitan Housing and Communities Policy Center, Washington, D.C; Jordana Barton, Federal Reserve Bank of Dallas; Erik Solivan, Denver Mayor’s Office of H.O.P.E. ; Austin Mayor Steve Adler, Travis County Judge Sarah Eckhardt and Evan Smith, Co-Founder of the Texas Tribune. Many thanks to JP Morgan Chase & CO. for being the presenting sponsor for the summit as part of their corporate commitment to economic empowerment.